Awesome support is great for end users. But we've also made it very developer friendly. In fact, one of our goals is to be the "go to" help-desk for developers. We want developers to choose our help-desk plugin for both their internal operations as well as for their clients. In order to make that a reality we have invested a huge amount of time and energy to create a number of features and resources specifically for developers and power-users. As far as WordPress help-desks go we do believe that there is nothing else available that can match what we offer to developers. The simplest thing we could do for developers was to make sure that we included hooks and filters in the most logical areas of our code. 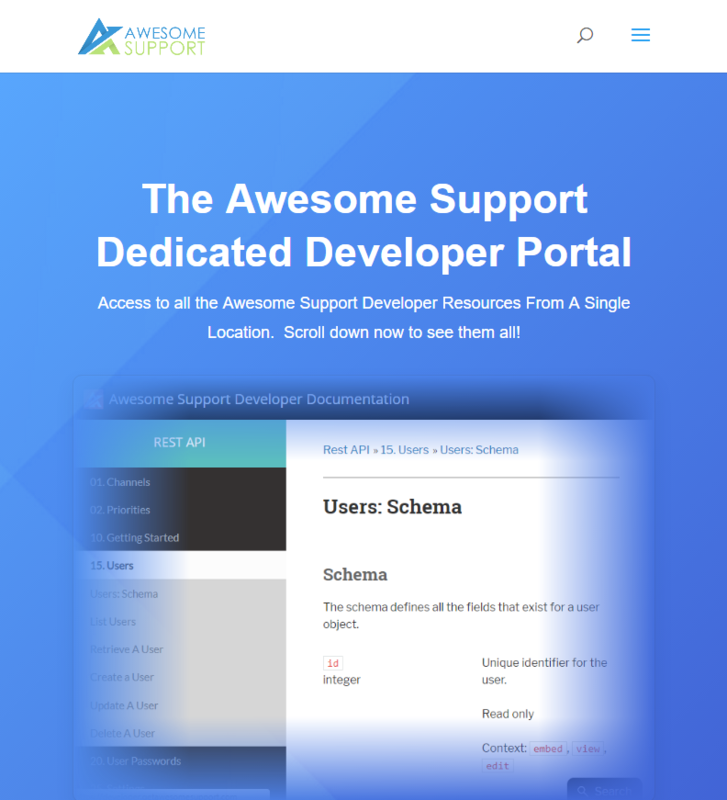 Today, the free version of Awesome Support has over 400 hooks and filters that covers everything from user registration to GDPR functionality. Simply put, if a WordPress developer needed to insert their custom process into a particular function, we probably have a hook for it. Developers can add custom buttons to the front end, create and modify custom fields, add new tabs in the ticket list in the back-end, create new settings tabs, run pre-and-post process checks when adding, editing, deleting and updating tickets and more! For developers looking to create a larger plugin that have multiple function points, we have created a fully documented template that can be used to do just that. Hosted as an open-source project on github, it is now in its second generation, sporting a 2.x version number. This latest version reduced the amount of code that a developer needed to get started by more than 70%! All a developer has to do is download the template and read the comments in the code to get started! Most serious developers today have used a REST API at least once. It is the most popular type of Application Programming Interface there is outside of the world of WordPress. And even inside of the WordPress ecosystem, more and more developers are creating and using REST STYLE apis. So, we have introduced our own REST API. Documentation for it can be found here. This type of API makes it easy to hook up Awesome Support to external systems. For example, we created a tutorial on how to push ticket data stored in GoogleSheets into Awesome Support using the REST API via Zapier. Developers and users can turn on the API inside of Awesome Support with just a couple of clicks. Client Tickets: Embed a complete white-labeled interface to your help-desk in any website you create for your customers. Your customers will be able to submit and respond to tickets without ever leaving their website. Developers can purchase these plugins and examine the code to see how the APIs can be used in a production level application. 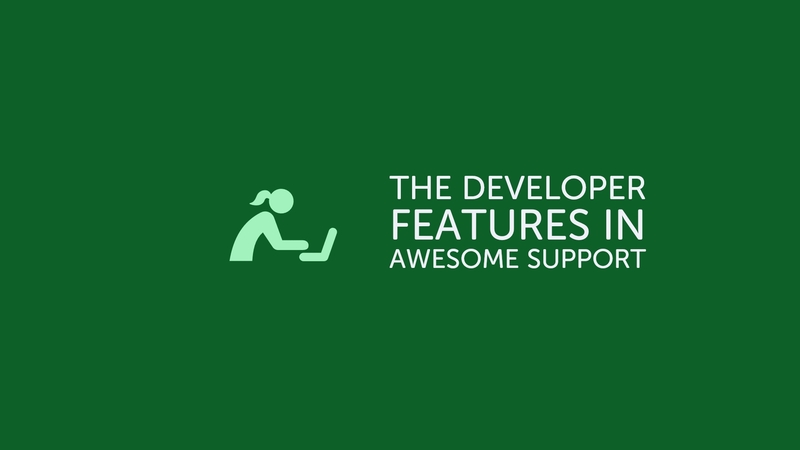 There, you'll find links to everything a developer might need to work with Awesome Support! All of the links and resources we described above can be found on the home page of this portal! If you're a developer, we hope that you find what you need. If not, drop us a note via our contact form or on WordPress.org and we'll definitely try to point you in the right direction!